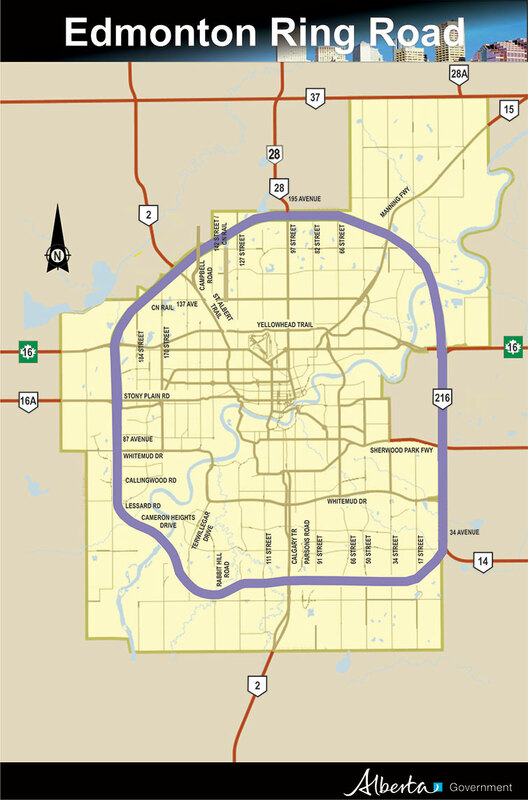 Anthony Henday Drive provides 80 km of free-flow travel around the City of Edmonton. Illustration of the Edmonton Ring Road project. Edmonton’s ring road, known as Anthony Henday Drive, took 16 years to build and encircles the City of Edmonton. The last section of the ring road was completed and opened to traffic in October 2016. This highway is a vital part of Alberta’s provincial highway network. It improves market access and quality of life for Albertans and helps promote the long-term economic sustainability of the Edmonton metropolitan region. The southwest leg of Anthony Henday Drive was designed to allow for 40,000 vehicles a day by 2020. Edmonton developed quickly and as of June 2018, this portion of the ring road now carries approximately 80,000 vehicles a day. Southwest Anthony Henday Drive is being expanded from 4 to 6 lanes. Design work is underway and construction is expected to begin in 2019. The project will take about 3 years to complete. Noise is monitored at different parts of the ring road to assess possible impacts on nearby communities. Computer noise models use existing and future projected traffic conditions to see what noise impacts could occur under various conditions.